"Waffle Day actually started as a linguistic misunderstanding - it's Lady Day today (that is, nine months before Jesus was born so.. well, let's not go into details) and in Swedish that's called "Vårfrudagen". That was quickly transformed into "Våffeldagen" which sounds somewhat similar." We're having some waffles at my parents, but I thought I'd give you my favorite recipe - it's been posted before, but that way you won't have to dig through the archives. Add the baking powder when you're ready to bake. Bake, using a waffle maker. You might have to grease it slightly before the first waffle. Don't use too much batter, or the waffles won't be as crispy. 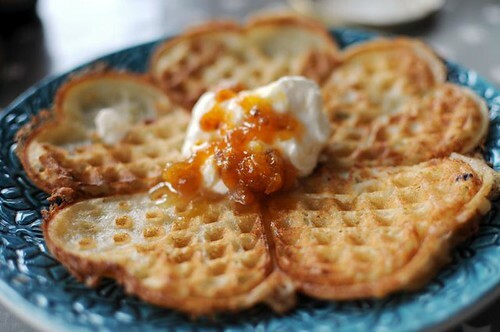 Serve them with whipped cream and your favorite jam - cloudberry or raspberry are probably my favorites. I made these this morning and they were very good even though I forgot and added the baking powder with the flour and baked the waffles in a Belgian style pan. Will definitely try them again and will be more awake next time! Carol - glad they turned out! I really want a Belgian waffle iron too. Lina - tranbärssylt?! Spännande, jag kan tänka mig att det blir jättegott. Wow, this looks so beautiful! I can almost taste it! Such a simple recipe with such a great outcome! What fun! If only I had known about Waffle Day in advance--and not have been on an airplane for much of the day! I actually have some Scandinavian heart-shaped waffles in my freezer right now from a recent baking session with my grandmother.